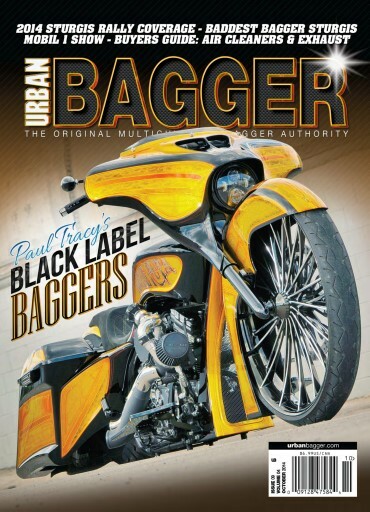 This issue of Urban Bagger has Paul Tracy of Black Label Baggers on the cover a 2014 Street Glide by the name of Pinche Puta. Inside you will find coverage of the 2014 Sturgis Rally, Baddest Bagger Sturgis and the Mobile 1 Readers Ride Show. The Buyer’s Guide has Air Cleaners, Exhaust and Fuel Injectors. 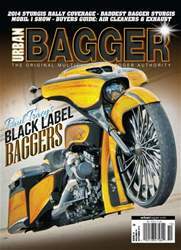 This issue also has the Baddest Bagger Winner from Kansas City Built by Chopp Shop as well as the Bikers Against Bullies Bike!